The St James Theatre in Orchard Street opened its doors for the first time on October 27th 1750, with a production of Shakespeare’s Henry IV Part 1. The Company comprised of just ten performers, headed by Mr & Mrs Kennedy and their daughter, assisted by Mr & Mrs Brookes, Mr Cox, Mr Dancer, Mr Morgan, Mr Malone and Mrs Bishop. It is the first purpose-theatre building in Bath – those that preceded it were makeshift conversions, known at the time as ‘Theatres of Sorts’. The only surviving makeshift establishment was in the basements beneath the City’s largest Assembly Rooms at that time, Simpson’s on Terrace Walk. Simpson had refurbished those rooms and reopened just two weeks before Orchard Street. The competition between the two establishments lasted until 1753, when Beau Nash brokered a deal between the two owners, resulting in the closure of Simpson’s theatre. The original form of the St James’ was a regular theatre set back from the street, with boxes at the opposite end to the stage. 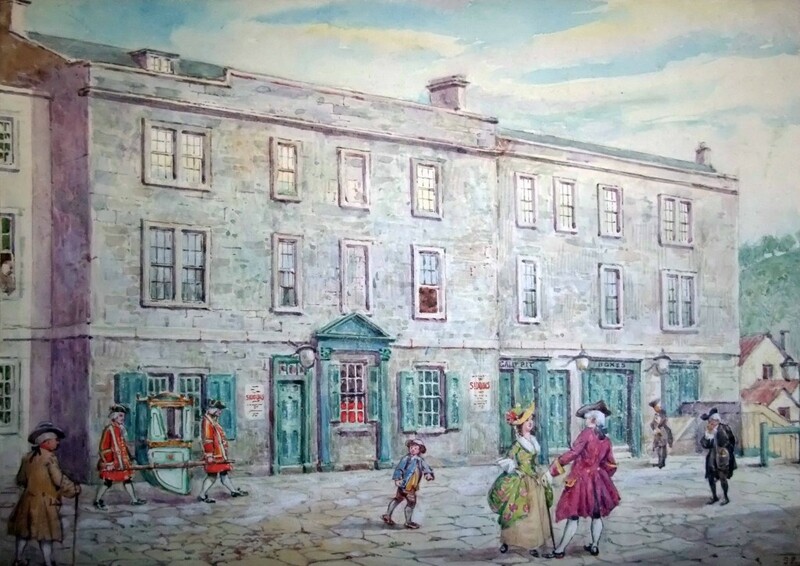 This changed in 1767 when the left portion of the frontage (see above) was added, creating much-needed dressing rooms for the actors plus an entrance foyer for the theatregoers. The roof was also raised into a decorous dome, allowing the addition of side boxes at stage level with standing galleries above. The refurbished theatre opened on 20th April 1767 with a performance of ‘All in the Wrong’ by Arthur Murphy. The Company had grown to number 23 actors, headed by William Keasberry who had been brought-in as actor-manager in 1756. It was in this form that a Royal Patent was awarded the following year, creating the first provincial Theatre Royal in England, and only the third establishment to receive that honour after Covent Garden and Drury Lane. In 1774 the final changes were made to the building, essentially consisting of the full-height extension to the right (see above). This accommodated a new and larger foyer area with open views into the pit area, essentially extending the pit on busy nights earning it the epithet of the ‘crush bar’. Above this, seven boxes were added, replacing the much smaller originals. The new ones, each accommodating up to 30 people, were all named after kings, and formed a fan-shaped balcony. The stage was completely remodelled, with stage boxes incorporated for the first time, and additional dressing rooms were added above the new stage. This is the basic layout that remains today. The much-enlarged theatre reopened on 26th September 1774 with ‘Macbeth’ peformed by a company of 33 actors and actresses, still headed by William Keasberry. There were also now star performers, including William Dimond and John Henderson, the latter moving-on to the London stage at the end of 1777. Locals feared their theatre would suffer by such a major loss, but they needn’t have worried because the owner, John Palmer Junior, secured the services of a young actress named Sarah Siddons for the beginning of the next season. Her first performance was on the 24th October 1778, in Colley Cibber’s ‘The Provok’d Husband’ a rather more comedic production than those that brought her the accolade of the greatest tragic actress of her time; in fact there are many who consider ‘The Tragic Muse’, as she was nicknamed, was the finest of all in those roles. She stayed in Bath for five seasons before she was whisked-away to Drury Lane by Richard Sheridan, and over the next thirty years she became first a national, then an international star. Once again, the locals thought their theatre would not survive such a loss, but such was the pre-eminence of the establishment by that time that it would attract the very best of the age, with names like Kemble, Elliston, Bartley and Incledon performing regularly. In 1786, the Company was acquired by Keasberry and Dimond, who shared both the management of the Theatre and the direction of the Company. Keasberry retired from the business in 1795, but Dimond continued acting for a further four years, before retiring from the stage to concentrate on managing the establishment. Such was his stature that Sarah Siddons herself returned for a short season in 1799, commencing on 26th January 1799 as Euphrasia in ‘The Grecian Daughter’ and finishing a month later in Mr Dimond’s final benefit, a production of ‘George Barnwell’. By this time, the limitations of the building were becooming obvious, not least that it was sold-out every night. The population of Bath had grown almost tenfold from when it had opened, swollen during the season by the best of society who wintered in the City to take the waters. A new building was needed, and William Dimond managed the transition to the new location in Beauford Square which was ready to open for the 1805/6 season, on the site that the current Theatre Royal still occupies. The final performance at Orchard Street was of ‘The Honeymoon’ by John Tobin, on 15th July 1805. The Company then numbered some 53 actors and actresses, plus a small orchestra that included members of Bath’s most famous musical family, the Loders. The final season comprised 170 separate perfomances, a huge contrast to the twenty that were managed in that very first first season back in 1750/51. After 55 years, and more than 5,000 performances, the building fell silent and would remain that way for over four years until its next owners came along. Pre-1700 There were theatrical performances in Bath, mainly performed by strolling players. Shakespeare's Company is reputed to have played at the Guildhall in 1596. In 1700, there was a Theatre (actually no more than a converted stable) on the site of what is now the Mineral Water Hospital in Upper Borough Walls. 1702 Queen Anne visits Bath. Her entourage included the entire Drury Lane Theatre Company, who found themselves only able to provide within that early makeshift building 'an entertainment of sorts for Her Majesty'. 1737 Theatrical Licensing Act passed. 1747 John Hippisley proposes Theatre syndicate. 1748 Hippisley dies, John Palmer Senior takes control of syndicate. 1750 St James Theatre opens in Orchard Street. 1778 Sarah Siddons joins Company. 1782 Sarah Siddons leaves for Drury Lane. 1803 Jane Austen writes Northanger Abbey. 1805 Theatre Royal moves to new building in Beauford Square. 1863 Rebuilt Theatre opened in Beauford Square.